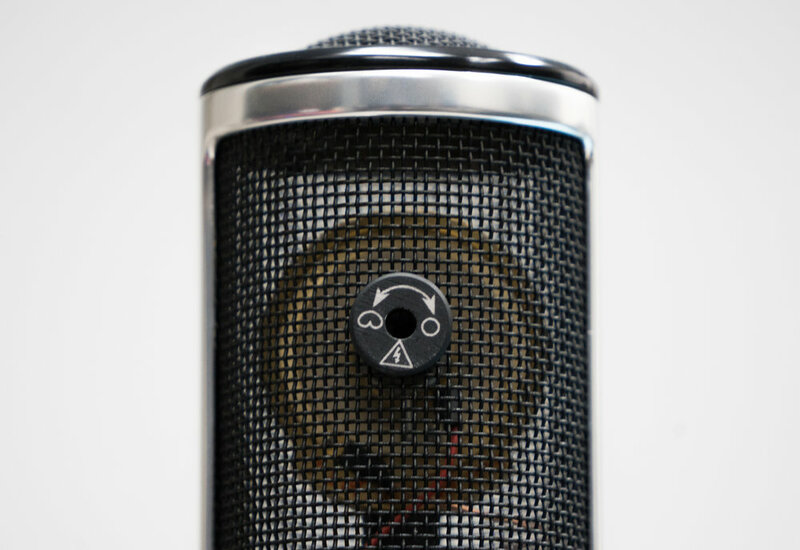 Manley Reference Silver Tube Microphone — Manley Laboratories, Inc. Taking inspiration from the fabled Sony C-37A, Manley Labs introduces the Manley Reference Silver Microphone. Featuring an American built capsule by David Josephson and a Manley designed circuit, this microphone has a warm and rich tone. The Manley Reference Silver Microphone offers a mechanical selector on the rear of the head basket that is switchable between cardioid and omni pick-up patterns. Boasting a mic grade 5670 vacuum tube, Manley IRON® transformers, and a low-noise switch mode power supply, the Manley Reference Silver Microphone is a studio workhorse. This microphone is at home in-front of instruments that range from female vocalists, to saxophones, from drum overheads to banjos. Use the Manley Reference Silver Microphone where you might be thinking about a ribbon, and use it with confidence! "…always elegant, without aggressiveness. We are indeed in the presence of a powerful microphone...we get everything we need without exaggeration." "The sound of the Reference Silver can best be summed up as ultra-smooth and rich yet crystal clear. Its top end, while quite detailed, has a beautiful roundness to it...it retains a great dimensionality." "On vocals—especially the female voice—acoustic guitar and violin, this mic is literally a natural. On more aggressive tones...it really surprised me by how well it worked to control and seat the high sizzle and amp aggression...without losing said aggression by sounding too pillowy." After 27 years since the debut of the first Manley Reference Gold and Reference Cardioid tube microphones which have since become modern classics, we introduce to you the Manley Reference Silver Microphone. The audio inspiration for this handcrafted beauty begins with the 1950s classic Sony C-37a microphone, and specifically with California capsule maker David Josephson's fantastic recreation of the C-37’s C-3 capsule which features an adjustable acoustic chamber on the rear of the capsule for the user to switch between Cardioid and Omni pickup patterns (see the adjacent photo for a close-up). This distinctive capsule is the heart of the rich and creamy tone that the Manley Reference Silver Mic delivers today, and reliably with a five year factory warranty. The old SONY mics are super-rare at this point, if you can find a decent working example of one! Like the other Manley Reference Microphones, all of the metalworking and construction is hand-assembled in the USA by our experienced staff in our Chino, California factory, located just 35 miles east of Los Angeles. We are sure you’ll love the organic nature of the intriguing artistic finish of the Silver Microphone as it will remind you about how natural and alluring the sound of this microphone is. The mic suspension is held onto the mic by a set of red silicone o-rings connecting FIVE pillars surrounding the mic, one set on the top and the other on the bottom of the mic. There are two sets of stainless steel screws and spacer nuts that hold the silicone o-rings onto these points and all you do is loop the o-rings onto these posts inner and outer. You can double up the o-rings for extra security and put two of 'em on each point and order two sets (20 total) if you'd like to. If you needs to order more o-rings, you can order a set of them from our parts store, www.tubesrule.com. They are RED SILICONE #114 O-RING's. Disconnect the power cable at the mic. Do not remove the mic suspension. You never need to. Remove the three phillips screws at the base (red part) of the mic that hold the case on. Grasp the body of the mic with one hand, grasp the base with the other hand. Carefully pull at the base of the mic (sometimes a slight twist will help), and slide the base out of the body just enough to expose the tube. Grasp the tube while holding the tube socket, and wiggle and pull to remove it. Install a new tube and put the case back on. If you have a buzz through the audio coming from your microphone, that can be a ground continuity problem with the body of the mic making good ground connections. If the mic is buzzing when you are holding it only by its suspension or it is just setting on a table or on a mic stand and it stops when you touch the body and grill with your hand, then you need to check out all the grounding points on the mic. For all of these tests, you never have to remove the suspension from the mic body. It can stay attached always. The easiest first thing to check is the two (or three on older mics) flat head phillips screws that secure the body-tube of the mic to the base. With the mic on a towel on a table (so you don't scratch it) lying down sideways, using a #1 Phillips Screwdriver, loosen and remove the body-to-base screws. The Manley Reference Gold Mics do not require this procedure as gold is conductive. On the Reference Cardioid Mic, the black anodize under the flat head screws should be removed exposing the aluminum in the countersunk cone-shaped hole. If it's not showing silver in the countersink hole, use a 1/4" or 3/16" drill bit with your fingers to gently rotate the drill bit in the countersink to scrape away the anodize layer to expose the underlying aluminum. Note that current production Manley mics use a stainless-steel 4-40 x 1/4" flathead screw in conjunction with an angled star washer to really dig in and make a good ground connection. Before that zinc-plated screws were used. If you happen to have black-oxide screws in your very old Manley mic, let's replace those with the stainless screw plus the internal tooth countersunk crinkle washer. Now slide the body-tube of the mic away from the base just a little bit to expose the innards of the base of the microphone. Slide up and wiggle. (The base and guts of the mic are all contained by a sub-chassis.) Repeat the drill bit exercise with the two (or three in older Manley mics) that those body-to-base mounting screws go into so that the bottom of the angled flat head screw digs into the exposed aluminum of the threaded hole. Rotate the drill bit with your fingers to expose the aluminum and create a slight conical seat for the screw. While you have the base exposed fully, in our older mics, you'll see some tapped holes around the circumference of the base that secure the XLR connector to the base. In really old Manley Gold mics, you'll also have a set-screw holding the 4-pin power connector to the base of the mic. It is important that these connectors are held tight and also that ground is carried to them by the grub screws. Using a 1/16" hex key, or Allen key, find those buried 4-40 x 1/4" grub screws in the base and back them out and re-tighten them to make the ground and physical connection integral again. (Lefty-Loosen, righty-tighty!) In very old mics, black-oxide coated grub screws were used. These days, we would use more conductive stainless steel set screws. Our newest mic designs use a stock chassis mount XLR connector held by two screws to the bottom end of the microphone base. Let's make sure those 4-40 Flat Head Phillips screws are stainless-steel (or at least zinc-plated) and not black-oxide coated. Let's also remove one at a time and perform the drill bit clearing exercise under the screw head in the countersunk hole to make sure there is a good metal-to-metal contact for best ground connection. Contact our Parts Department to get an up-to-date screw kit for your mic by filling in the Service & Parts Request Form. At this point, after you put the mic back together and retest it, if the buzz is still there, with the mic on, see if touching the screen or top of the screen makes any buzz go away. Hold the XLR cable shell so you are making the ground path between the screen and the XLR cable metal shell. If the screen is loose, it will need to be expoxied back in place with silver conductive epoxy. If touching the case makes the buzz go away then we still have grounds not being made in the base of the mic so go back and repeat the base-screws grounding exercises. Next step would be more advanced, checking the power supply volts, especially the heater regulator to make sure you have 12V coming off him... looking for a bad cap in the PSU that isn't doing his job of removing ripple, etc. If nothing you try works then we'll arrange an RA# for you to send it in. Give us a holler on the Manley Service Request Form if you need more help or a schematic. Where is my mic's serial number? The Manley Reference Microphone serial number is located on the inner face of the mic suspension plate flanking the hole where your mic stand attaches to the mic suspension. I need a frequency response plot and a polar response chart! In 30+ years of producing microphones we have never provided plots and charts as we do not have an anechoic chamber or empirically correct measuring space that would give you useful charts. So we don’t provide half-assed ones either. I have visited a microphone manufacturing facility in China and I witnessed a lady drawing a pretty curve by hand for each microphone they were packing up… yeah, really.